Published: Fri, September 13, 2013 @ 12:08 a.m.
Chuck Joseph, of the real-estate company Routh-Hurlbert in Warren, details a $70 million fuel depot at the Ohio Commerce Center in Lordstown being built by Houston-based Halcon Resources Corp. to store and distribute oil produced across the Utica Shale play. 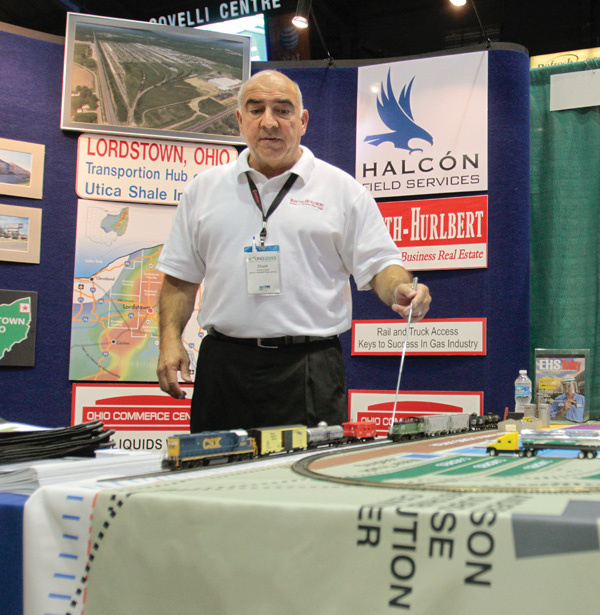 Excitement over the Utica Shale at this year’s Youngs-town, Ohio Utica and Natural Gas Conference & Expo took on a different feel this year, as participants discussed how to move development along and cater to a play that is now about three years old. Experts, speakers and vendors agreed that the play still remains in an exploratory phase as oil and gas drillers continue to define their acreage and develop more- economical ways to extract oil and gas from the Utica. This year’s conference, which attracted more than 1,000 people to the Covelli Centre on Thursday, focused on meeting the challenges of the play now that about 526 wells have been drilled. To address the changing state of the Utica, the Youngstown/Warren Regional Chamber focused this year on production, processing and midstream services. Tony Paglia, vice president of government and media affairs at the chamber, and his colleague Eric Planey, vice president of international business attraction, said this year’s conference attracted more logistics and service companies that helped foster better business-to-business networking. The aim, they said, was to focus on the Utica’s potential and how it can be fulfilled. Of the 95 vendors that participated, more than 40 worked in some sector of the oil and gas industry. Financial and accounting firms such as PNC Bank and Hill Barth & King were on hand, while midstream and pipeline services were well represented with the likes of NiSource, Mid Ohio Pipeline Services and Precision Pipeline exhibiting. Nearly all the vendors at Thursday’s conference have a local or regional presence. Thomas Stewart, executive vice president of the Ohio Oil and Gas Association, said exploration and development remain on track in the Utica despite what appear to be setbacks. He said the play cannot be compared with the Marcellus Shale in Pennsylvania, which is a younger rock where drilling began at a time when the marketplace demanded more oil and gas. Responding to a question about the pace of development here, which has slowed this year, Stewart said the difficult market conditions with a boom in supplies and lower prices have slowed the pace of earlier development. He said oil and gas companies remain firmly committed to the play, and he attributed some of the high expectations in the play’s first years to misinformation about the play’s potential from elected officials and the news media. Harry Schurr, general manager of Utica operations for Pennsylvania-based Consol Energy, said the Utica remains a challenge for many producers with its varying depths, oil, gas and condensate windows and a lack of infrastructure to move product. But he pointed out that the Barnett Shale in Texas took about 15 years to develop and said operators have an advantage here because they’re learning quicker. 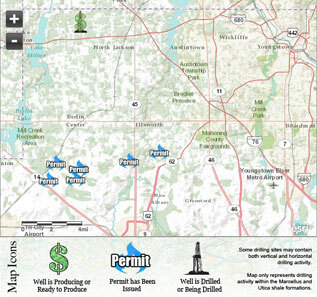 Consol has thus far drilled 215 Marcellus and Utica wells, while its joint venture partners have drilled 77 wells. Although it has been most active in the southern part of the state, where it plans to continue its focus, Schurr said Consol is paying close attention to its wells in Mahoning and Trumbull counties, while watching its competitors closely here. He said the counties are very much “in the cards” for the company, but it’s too early to tell what kind of additional development will take place here from both Consol and other operators. Paglia said this year’s conference will either match or exceed last year’s event when attendance was up from YOUNG’s first year in 2011 by 33 percent. The chamber was forced to cancel today’s breakout session after guest speakers from two midstream companies canceled last weekend due to a conflict in their schedule.